Living Space: 2300 sq. ft. This is one of the best homes on the market today! 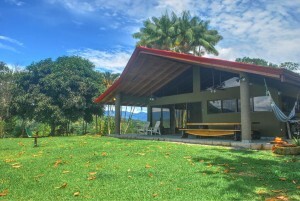 It is a tastefully built 2 bedroom home located on 2.5 acres in the prestigious community of Lagunas. The property sits at 900 ft above sea level but it only takes 12 min to drive to the beach, 8 min on a very well maintained gravel road and 4 min on a paved road. This property is very unique in the fact that it is a finger that sticks out into the middle of a giant mountain valley which allows it to have views in all directions. The home is facing north west up the coast and has whitewater ocean views from Dominical to Manuel Antonio and sunsets over the ocean most of the year. Then as you turn your head to the east you see the most spectacular mountains you have ever seen including Mnt Chirripo, the tallest mountain in the country at 12,533 feet. And if that isn’t enough, the sunrises from behind this mountain range are so amazing you think you are in a painting!!!! The home is designed to bring the outside in. The 15 ft high peak in the center of the ceilings allows for plenty of light and a very open feel. The house was build with huge windows so no matter where you are in the home you still have an amazing view. The kitchen and living room are designed as one large space separated by a custom wooden bar. The high end kitchen appliances and over sized kitchen are every cooks dream. The bathroom is also very large with an amazing shower and beautiful wooden counter top. All of the furniture was custom built for the home from bamboo and native hardwoods and is included in the sale. There is also a 2 car covered car port that is connected to the house and finished with tile and tongue and groove ceiling just like the house so it has an elegant feel from the minute you park. Attached to that is a large bodega with plenty of storage and the laundry room. The property has a second building site with equally amazing views in all directions and it’s own separate driveway. Right now that building site has a small wooden cabin perfect for a caretaker and also a greenhouse that has been producing organic vegetables for over 6 years now. The property is full of mature fruit trees including many different kinds of mangos, bananas, plantains, oranges, limes, lemons, guanabana, mamones, coconuts, guavas, and many more!!! The fact that this property has the second building site opens up many possibilities. Someone could just live in the existing home and continue to garden below, or they could build a second home for rental income, or build a much larger home below and keep this existing home as a guest home or rental. To add to that, there is a 5 acre parcel for sale adjacent to this one with one ocean view building site and multiple mountain view building sites. There are no restrictions here so the sky is the limit!!!!! !